The millet fields of Dah Village were still green but they were gradually turning golden with the touch of autumn. Those small but fecund plots were also dotted with tomatoes, pumpkins, and other vegetables and as expected, the apricot and walnut trees were as expected. However, this was not something I had not seen before. What was unique this ugh was the presence of flowers. The vegetables seemed intertwined with many colleges useful flowering shrubs. I understand the visual allure of flowers but why would anyone take so much effort complaint them in every agricultural plot? The mystery did not last long. I saw a group of people coming towards me. They all had caps and flowers atop the caps. Of course, why did I not realise it earlier! This is a Brokpa village. So, these flowers are not planted merely to beautify the plot. These flowers are an integral part of their culture and they always end up in their iconic headgear! Yes… they go to the headgear! I had reached the village after a reasonable hike disguised as a short walk. As I had mentioned in an earlier post, we reached Skyaba Homestay, which was traditional house obscured by a vineyard, after a short hike from the highway with the help of a Frenchman who had visited the same place 8 years ago and was visiting again with his wife. The rooms on the ground floor were full but the terrace rooms were available and those austere rooms also gave a good view of those millet fields, cabbage patches, and vineyards. After settling down at the homestay, I went out for a stroll around the village. Among other things, I noticed a noticeable effort to revive the Dardic heritage of the Brokpa and understand their own roots. Several noticeboards with information related to the same have been erected all over the village. The first one I saw was the one describing the village deity although I could not see much. This is the place of local deity Srigmo. The deity is said to fulfill the needs and aspirations of local people. Earlier, diseased people were taken to this place for getting rid of diseases ans a goat sacrifice was made. One member of the Lhabdak family of Dah village meditates here for seven days before the commencement of the Bonona festival of the dards. During meditatoon he takes very little food and on the last day a goat is sacrified for the welfare of the people. Ritual objects like horns of ibex, goat, and sheep are kept here along with the holy Shabdak stone. The second thing I noticed was the Aryan Heritage Museum. I could not take any images inside the dimly lit room but it was an interesting collection and another attempt to reclaim the Dard Heritage. Ancient traditional pottery, dress materials, holy shabdak stone, some ritual objects are collected from individual houses and kept in the museum was established by an young scholars of Da Village. Another few yards brought me to a heap of stones near a small plot of millet that I would not have noticed but there was another noticeboard explaining that it is the remains of a Dardic Fort. According to tradition once 40 dard families living under one roof at this fort in Dah village. Earlier the fort was a three storied structure, the ruins of which can be still seen in the village. Recently due to lack of knowledge and negligence, a Govt medical sub center was built over it but some parts of the ruined fort is still visible. Another board pointed towards some rock on the other side of the hill and connected it to Gil Singe, a legendary king of the Dards. The natural Rock of King Gil Singe along with his soldiers is seen on the opposite side of Da Village. Apparently he ruled this area in the 2nd century AD. Many ruins related this famous kings Gil Singe, Galo Melo Dullu, Yanng Dring is found all over this area in villages like Dah, Garkone and even Turtuk. What I liked about them is that there is a serious attempt at reclaiming the history and they are avoiding the misleading popular stories such as the one receiving them as descendants of Alexander. The next morning I set out towards Biama after breakfast with the French couple, Charlotte (I clearly remmeber her name) and Pierre (Sorry i forgot the name but replacing it with a typical French name). Pierre was keen to meet his friend Londup from his previous trip 8 years ago but we were not sure where to find him. So, we just started along the road and soon we started coming across another set of informative noticeboards. The first one was of those prehistoric rock inscriptions that innate already documented in another post about Domkhar. The second one was even more interesting although there was nothing remaining to be seen. The their one also pointed to a rock on the other side of the river but we could hardly see anything. Natural rock of Guru Rinpoche (Padmasambhava) is seen on the hillock on the opposite bank of Indus, 2 Kms before Dah. We slowly reached Biama. I could see a shiny monastery far a top the hill. Many Brokpas are now Buddhists but they have maintained their own traditions a sculptures and have not been overpowered by more dominant cultures. As far as the village is concerned, it looked sleepy. In fact, some houses looked submerged in the river, which was a result of a flood a few years ago, as we were told by the locals. So, nowadays most constructions are seen higher up the hills. To behonest, after Dah, Biama did not seem as exciting. We had some food at a roadside restuarant, which was practically the only restaurant we saw in the area. After that, somehow we got lucky as Pierre’s old friend appeared from nowhere and spotted him. As it turned out, he was now living in Baldez, the pretty village on the other side of the river, across a hanging bridge. He invited us to his place. We crossed the bridge, entered the village, another one covered with apricots and walnut trees, and reached Londhup’s house, wehere is mother was also there. We were offered apricots, tea and biscuits and we started talking about their lives. It can get difficult but they seem to be doing well. His daughter is now studying somehwere in Delhi and he occassionally visits her. He used to run the homestay in Dah earlier. But now he is busy with his household work as his wife was not keeping well. Agriculture and husbandry seemed to take a lot of his time. After meeting Lhondup, and filling our pockets with apricots and walnuts that he generously offered, we started walking back towards Dah. I wanted to chek out the other route from the front, so I left my French companions to take the shortcut and walked ahead. AFter a while, I reached a checkpost. The road goes ahead all the way towards Batalik and Kargil but a sharp U-turn climbed higher up towards the village. This stretch was actuall more beautiful although I could not do justice to it in the fading light. A stream was flowing down towards the Indus and autum colours were ruling the banks. The road bifurcates at one point and so I was a bit confused. A truck came from behind and stopped. Several local women came out. Apparently they work somewhere nearby and were returning home. So, I followed them and finally reached the village. The visit to Dah Village was more or less over at this point and I was supposed to return the next day. However, I was not happy. The travelogue was not going to look complete without a clear portrait of a Brokpa in traditional attire and so far I’d had none! But this was also sorted out by the time I reached my homestay. There was an old lady, complete with that floral headgear, and she agreed for a photograph immediately! For details of travelling and exploring the Brokpa region, read my Aryan Valley Guide. I will go here.. Thanks! I’m glad I found this post, and I happen to be in India right now! What a beautiful place, it looks so quiet and peaceful and serene. I love the petroglyphs and the flowers! Where can you stay there and how long would you recommend visiting for? How great to visit when the fields were all in bloom. The flowers in the vegetable fields look beautiful. It is great that there are several different spots to learn about the Dard heritage. Nice to meet a local who could take you to Baldez. And a homemade meal too! Sounds like a great day. Its rare that one gets to read posts about areas in Ladakh other than Leh, Nubra and Pangong. It seems to be such a pure and simple life these people are leading there. The trip must have been very refreshing. These are some beautiful hidden from world. The head gear with flowers is amazing. What a lovely culture! What an intriguing story and culture. The Brokpa lady is so lovely and that floral headpiece is amazing! Thanks so much for sharing this part of the world with us. Any chance it may become a UNESCO World Heritage Site? Seems fitting for such an exquisite area. I have never heard of Brokpa village before. Wow, I like the headgear with flowers. It is so pretty. I want one. 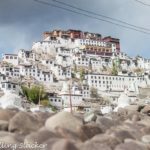 I have been to Ladakh but cannot quite place the names of the villages you mention – Dah looks pretty amazing and homestay in a place like this has to be a great idea! I love the landscapes of Ladakh and even Baldez village looks great. What a lovely way to immerse yourself in nature and culture at the same time. Dah Village looks like it has a rich culture and the people seem to lead tranquil lives. A homestay would be a fantastic way to learn more about their culture. Really nice blog and beautiful pictures would love to visit that places once.